A solar-storage microgrid demonstration at a California hospital aims to deliver substantial energy cost savings, as well as enhance reliability, resiliency and environmental quality. 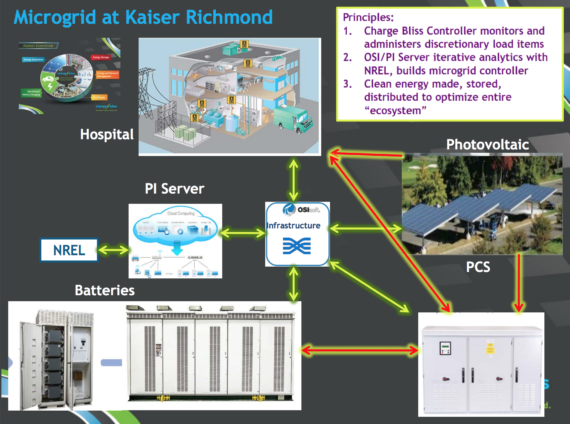 Renewable energy microgrids, such as the one up and running at Kaiser Permanente’s Richmond Medical Center, have the potential to reduce hospitals’ energy bills by as much as 50 percent, Charge Bliss CEO David Bliss told Microgrid Knowledge. The Richmond Medical Center is a 50-bed, acute-care facility. Though moderate in scale in relation to the hospital’s overall energy loads, the microgrid demonstration project carried out by Kaiser Permanente, Charge Bliss, the California Energy Commission and the Office of Statewide Health Planning and Development is notable in several other respects, said Bliss, who is himself a medical doctor. The microgrid is the first in California to connect renewable energy to a hospital’s pre-existing, diesel-fueled, back-up power system. To the company’s knowledge, it’s also the first, on-site microgrid in California, and perhaps the western US, to deliver renewable energy to a hospital, Bliss said. “The significance of that is fairly large. The current state of the art, at least in California hospitals, is that when grid power goes down, automatic transfer switches open and disconnect the hospital from the utility grid. Then the hospital has to depend on diesel generators to sustain operations,” Bliss said in an interview with Microgrid Knowledge. The solar-storage microgrid Charge Bliss designed and installed at the medical center is much more efficient, less costly and less polluting, Bliss said. Backed by funding from the California Energy Commission, Charge Bliss also designed and installed the system’s microgrid controller, which automatically optimizes solar energy production and battery energy storage. 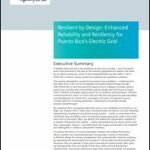 As a result, the microgrid can not only meet the hospital’s critical power needs in the event of a grid outage, but also deliver significant cost savings. In addition to Charge Bliss’s custom-designed microgrid controller, the Richmond Medical Center microgrid combines a 250-kW solar PV-parking lot canopy; a 1-MW lithium-ion battery energy storage system; an existing, on-site heat and power system and real-time analytics linked to the high-performance data center at the National Renewable Energy Laboratory in Golden, Co. The microgrid can operate in island mode, automatically disconnecting from the utility grid and supplying power for critical hospital needs for three hours or longer. Kaiser Richmond expects the microgrid to cut energy costs — an estimated total of $141,000 per year in direct energy cost savings for the 20-25 years the system is expected to be in operation. Part and parcel of that, the microgrid will reduce the hospital’s grid power purchases by some 365,000 kWh/year, a projected cost savings of around $54,750 annually. There’s more. Able to improve operational efficiency as much as 20 percent, Kaiser Richmond stands to save an additional 2.63-MWh of energy per year, resulting in annual savings as high as $394,000 as a result of investing in the microgrid, according to Charge Bliss. That includes reducing peak-period utility demand charges by as much as 200 kW, as well as decreasing use of preexisting, back-up, diesel-fueled power generation. Given 1.5-MWh of emergency energy demand at a diesel-fueled generation cost of $0.50/kWh, project partners estimate the resulting savings could run as high as $750 per hour. In addition, Kaiser Richmond also gains the ability to participate in utility automated demand response programs. The hospital stands to gain anywhere from $40,000-$80,000 per year in payments as a result. Added initial savings of $7,884 a year savings may come from power arbitrage (storing energy produced on-site when grid prices are low for later use or sale on the market when they’re high). Turning to environmental benefits, Kaiser Richmond will be able to avoid an estimated 263 tons of carbon dioxide emissions annually as a result of the generating solar energy on-site. “Of course, it’s very difficult to predict what technological advances and innovations will emerge over that period of time, but the infrastructure we’ve installed can be replenished. The groundwork is in place for the hospital to upgrade the platform and adapt as technology improves and as their energy needs and usage evolves,” Bliss said. The California Energy Commission’s Electric Program Investment Charge (EPIC) program provided $4.7 million for the Kaiser Richmond hospital microgrid. The other project partners, OSIsoft and Princeton Power Systems, contributed the remaining $2 million. Energy costs, security and reliability loom large in hospital budgets, as well as their ability to carry out their primary mission. The Richmond Medical Center microgrid is a breakthrough concept in that it adds to the benefits of solar energy by making it a much more resilient and flexible renewable energy resource, Bliss said in an interview. “The addition of intelligent batteries and custom-designed controls advances solar from being a passive renewable energy resource to one that can provide ‘dispatchable’ energy and meet the energy needs of hospitals and other types of buildings and infrastructure,” he said. Project partners will host a celebratory event and showcase the microgrid publicly, including a “deep dive” into its technical aspects, on July 20, Bliss noted. Those interested in attending can contact Charge Bliss. 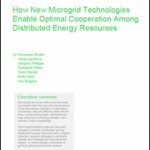 Track news about solar-storage microgrid projects. Subscribe to the free Microgrid Knowledge newsletter.